8900 Reidak is a BIONICLE set released in early 2006. It contains Reidak, a Piraka. He carries a drill and a Zamor Sphere Launcher. He was once part of the Dark Hunters organization. After he left the Dark Hunters he went with the other Piraka to Voya Nui hoping to find the Mask of Life. This is a description taken from LEGO.com. Please do not modify it. (see an archive of the product's page) Brutal enforcer! Strongest of the Piraka, Reidak lives for destruction. His power to adapt after every defeat makes him virtually unstoppable! His infrared and thermal imaging vision lets him track down his enemies so he can send them to crushing defeat. His combination drill and buzz saw can turn solid ground to quicksand! Includes zamor spheres and launcher. 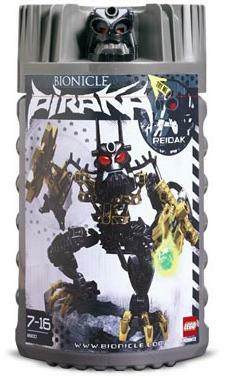 Piraka eyes light up and teeth glow in the dark! Pushing hard on the rubber piece on his launcher will fire a sphere. Pushing down on the back of his head causes his eyes to glow. He can rotate his weapon if you rotate his left hand. Reidak is known as "The Tracer." A prototype for Reidak's face/spine.